I only had a miniature of Teaninich so I was interested in upgrading to a full 70cl. The SMWS had a tempting discount before Christmas so I decided to plump for this vintage 30-year-old. With only 140 bottles produced I wasn’t expecting to find it in the Whisky Bible but it was released in 2014, which provided plenty of time for a review. My incorrect assumption was that new bottlings by the SMWS sold out very quickly but that probably only applies to releases of the popular distilleries like Ardbeg, Macallan, Laphroaig, etc. Teaninich is more Partick Thistle than Celtic with regards to popularity. An acquired taste but entertaining nonetheless. 89.33/100 on Whiskybase is a fantastic score albeit from only 3 voters. Interestingly the two bottles Jim Murray ranks above it with 87/100 and 90/100 score 88/100 and 89/100 on Whiskybase, which is less than for my bottle. All are excellent marks and show that the SMWS team have a good palate when it comes to choosing a Teaninich cask. A very worthwhile dram! Finally I have an example of whisky by the independent bottler ‘Signatory’. They’ve proved very tricky to purchase at auction because they’re always very popular. I think it’s partly because of their reputation for good quality, partly because their bottles come with a nice tube, but also because even a miniature has information about the cask and bottle number on it. 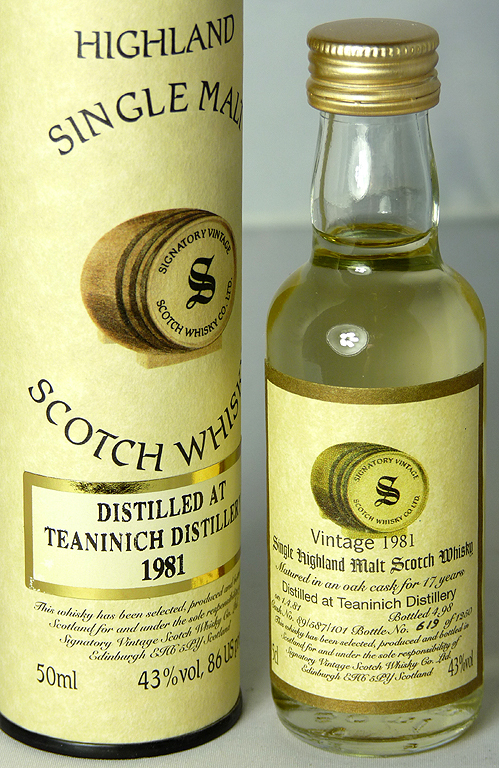 My little example is bottle no.619 from 1250 taken from cask 89/587/101 and bottled in April 1998. Fascinating! 🙂 This may seem like it brings out the inner train-spotter but it’s this level of extra detail that adds value to a whisky, unfortunately. I say ‘unfortunately’ because whisky is expensive enough, and I’m more about the taste than having the master distiller’s inside leg measurement on every bottle. When I drink this will I remember it was bottle 619 from 1250?! Will I care?! Not in the slightest. But if it tastes great than I’ll be after another example from Teaninich!